Jason Snyder and Briana Feola compiled all the best hidden gems along the "Triple Crown" hiking trails. The best maps don't just tell you how to get where you're going. They also show you where to find secret pancake houses and wild ponies. These posters are for hikers who go the extra mile for a hidden gem. Choose from the three "Triple Crown" trails including the Appalachian, Pacific Crest, and Continental Divide. They have hundreds of insider tips, like the best places to watch the sunset and lesser-known look out points. Fun, vibrant, and packed with unique info, they make a lovely gift for outdoorsy friends and avid hikers to boot (har har). Designed by nature enthusiasts Jason Snyder and Briana Feola. Made in New Hampshire. Briana Feola and Jason Snyder met in college and have been putting their creative heads together ever since. They run a small studio in New Hampshire making unique prints and designs for people who love nature and science. Between designing, drawing, and answering emails, the creative duo can be found exploring outdoors with their dog. We hope they’re out soaking it in now, because we can’t wait to see what they dream up next. To flatten, unroll print from tube. Place print upside down on a clean flat surface. Place heavy objects, like books, on all four corners and the middle and let rest. Remove heavy objects and hang. Avoid hanging in direct sunlight. 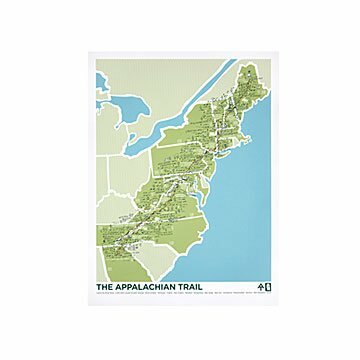 I bought this as a gift for someone who has been hiking the Appalachian trail for the past 3 years. It shows all the places he's camped and seen. Really cute!